The O&P Almanac is the most respected source for industry insight and association news in the Orthotic & Prosthetic Industry. Featured topics include emerging technologies, coding and reimbursement education, premier meetings, people and businesses in the news, and industry modernization. Get your print subscription or free digital subscription. 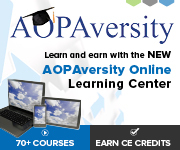 Earn CE credits by reading the monthly reimbursement column and quarterly compliance corner and taking a short quiz and receiving a passing grade of 80%. AOPA will automatically transmit the information to the certifying boards on a quarterly basis. Take past quizzes. Looking for past editions of the O&P Almanac? Visit our O&P bookshelf. Archived issues from 2009-present may be viewed here. If you are looking for an archived issue of the O&P Almanac from an earlier date, please landerson@aopanet.org. Interested in advertising in the O&P Almanac? 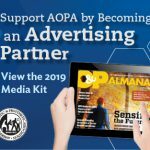 The 2019 AOPA Media Kit explains all of your advertising opportunities within the O&P Almanac as well as other AOPA publications. Please contact AOPA’s Advertising Sales Manager, Bob Heiman, at 856/673-4000 or bob.rhmedia@comcast.net. As a member of AOPA, or a credentialed practitioner with ABC or BOC, you receive a print copy of the O&P Almanac monthly. If you are not a member of AOPA, or a credentialed practitioner with ABC or BOC, you may purchase a year subscription of the O&P Almanac in the AOPA Bookstore. 2015: Graphic Design Award of Excellence from Graphic Design USA’s 53rd Annual Design Competition for December 2015. The December 2015 design was featured in the Graphic Design USA Award issue. Bronze award Association TRENDS’ 2015 All Media Contest for the monthly trade association publication category.